Since the early days of the Church Christians have gathered to worship God, to listen to Holy Scripture, to pray together, and to share in the Eucharist (thanksgiving) instituted by Jesus for the disciples when he broke bread and shared the cup of wine saying "do this in remembrance of me." It is in baptism that we promise to continue in the apostles' teaching and fellowship, in the breaking of bread, and in the prayers (BCP pg. 304). It is in the sharing of the Eucharist that we are strengthened and nourished before being sent out to do the work God gives us to do. 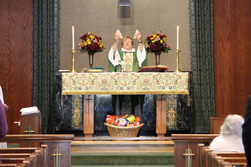 At St. Mark's we celebrate the Eucharist three times on the weekends. At 5 pm on Saturdays and 8 am on Sundays the service is about forty minutes without music. At 10 am on Sundays we celebrate our principle service of Holy Eucharist with music from our choirs. Additionally we celebrate a mid-week Eucharist on Wednesdays at 9:30 a.m. This is a simple service that will often commemorate a saint or Holy Day from the week's calendar and includes a Litany for Healing with anointing.